Exeter, PA – Exeter Commons, Berks Cty's most exciting new retail destination, is progressing ahead of schedule, with some of the nation's top retailers opening their doors in late Summer 2009. The $75 million power center is being developed by Exeter JV Associates a partnership of The Goldenberg Group and Ironwood Property Group. "Exeter Commons has been a high-development priority for Exeter Twp for more than 10 years," said Kevin Trapper senior vice president of The Goldenberg Group. "A number of national developers were thwarted by seemingly insurmountable technical and traffic obstacles. 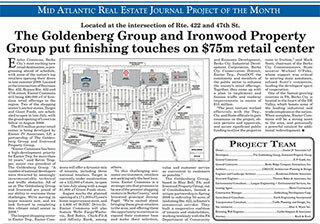 All of us at The Goldenberg Group and Ironwood are proud of our ability to overcome those challenges." "In this challenging economic environment, retailers are seeking only the best locations. Exeter Commons is a strategic site that promises to be one of the premier shopping centers in Berks County," said Jeremy Fogel, principal of Ironwood. One of the fastest growing counties in PA, Berks Cty is located in the heart of the DE Valley, which boasts some of the leading industrial and trade complexes in the nation. When complete, the CREATE designed Exeter Commons will be a strong asset to the area and potentially a powerful catalyst for additional redevelopment.